It can identify dangerous plaques in the arteries which nourish the heart. If a fatty plaque ruptures, it can lead to a clot, blocking the flow of blood. Scientists at the University of Edinburgh said an effective tool for predicting a heart attack would make a “massive difference” to patients. Experts said it was an exciting start. More than 100,000 people have a heart attack in the UK each year and disease of the arteries around the heart is the leading cause of deathin the world. The researchers used a radioactive tracer which can seek out active and dangerous plaques. This was combined with high resolution images of the heart and blood vessels. The overall effect is a detailed picture of the heart with the danger zones clearly highlighted. The technology is already used to detect tumours in cancer patients. 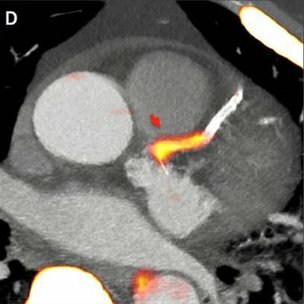 The first tests of the technique for danger spots in the heart were on 40 patients who had recently had a heart attack. 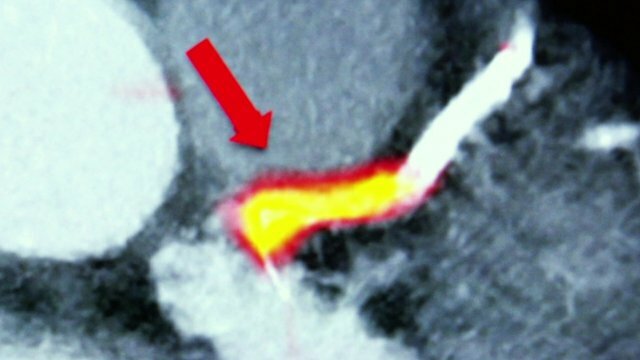 The scan highlighted the plaque which caused the heart attack in 37 of the patients according to a study published in the Lancet medical journal. It is the first time a scan has been able to identify danger zones but further tests are needed to see if detecting dangerous plaques before, rather than after, a heart attack has the potential to save lives. “I suspect not all plaques detected will cause a heart attack, but it could be useful for identifying high risk patients who need aggressive therapy,” cardiologist Dr Marc Dweck told the BBC. This could include drugs such as statins or aspirin, drastic lifestyle change or even inserting stents into the arteries to keep them open. The researchers will look at high risk patients, including those about to have surgery, to see if the scan can save lives. Dr Dweck said if this scan or similar ones proved successful it would make a “massive difference”. He said: “Heart attacks are the biggest killer in the Western world and there is no prior warning, the first time people know about heart disease is when they have a heart attack. Prof Peter Weissberg, the medical director of the British Heart Foundation, said: “Being able to identify dangerous fatty plaques likely to cause a heart attack is something that conventional heart tests can’t do. “This research suggests that PET-CT scanning may provide an answer – identifying ‘ticking time bomb’ patients at risk of a heart attack. via BBC News – Heart attack risk identified by new scan. (Photo : Angelo DeSantis/Flickr) Three or more weekly servings of blueberries and strawberries could cut women’s risk of heart attack by a third. Three or more weekly servings of blueberries and strawberries could cut women’s risk of heart attack by a third, according to a new study. They study published in the journal Circulation: Journal of the American Heart Association, found that these berries contained high levels of beneficial dietary flavonoids called anthocyanins that may help dilate arteries, combat the buildup of plaque and provide other cardiovascular benefits. Researchers said that these dietary flavonoids are also found in grapes, wine, blackberries, eggplant and other fruits and vegetables. While other foods can also benefit heart health, the researchers specifically chose to analyze blueberries and strawberries because they are the most eaten berries in the United States. “Blueberries and strawberries can easily be incorporated into what women eat every week,” senior author Eric Rimm said in a statement. “This simple dietary change could have a significant impact on prevention efforts,” added Rimm, who is also an associate professor of Nutrition and Epidemiology at the Harvard School of Public Health in Boston, Massachusetts. Rimm and his team from Harvard School of Public Health in the United States and the University of East Anglia, United Kingdom, conducted a prospective study among 93,600 women between the ages of 25 and 42 who were registered with the Nurses’ Health Study II. The women had completed surveys about their diet every four years for 18 years. Researchers said that during the study, there were 405 heart attacks. The findings show that women who ate the most blueberries and strawberries were 32 percent less likely to have a heart attack compared to women who ate the berries only once a month or less. What’s more, the findings were true even in women who ate a diet rich in other fruits in vegetables. “We have shown that even at an early age, eating more of these fruits may reduce risk of a heart attack later in life,” Aedín Cassidy, lead author and head of the Department of Nutrition at Norwich Medical School of the University of East Anglia in Norwich, United Kingdom, said in a statement. Researchers said that the findings were independent of other risk factors like age, high blood pressure, family history of heart attack, body mass, exercise, smoking, caffeine or alcohol intake. Whether you’re stuck in it or breathing in the fumes, traffic is no good for your health. Now, a new study from Denmark finds that there’s something else about roadway traffic that’s bad for you: the noise. Researchers found that people who lived with louder sounds of traffic near their homes had a higher risk of heart attack. For every 10-decibel increase in traffic noise, there was 12% higher risk of heart attack, according to the study by researchers at the Danish Cancer Society. The researchers said they started seeing increases in risk starting at around 40 dB. Lead author Mette Sorensen and her fellow researchers followed more than 50,000 men and women ages 50 to 64 living in Copenhagen and Aarhus, two of Denmark’s largest cities. Each participant reported their lifestyle behaviors like diet and physical activity, as well as each place they lived over a 10-year period. The researchers monitored the participants’ health over the course of the study, comparing it to the geographic location of their homes. Researchers also figured out how much traffic noise each person had been exposed to by analyzing traffic patterns around the participants’ homes. During the 10-year study, 1,600 people had a first attack and their risk was greater the louder the traffic noise near their home. The link between noise and heart attacks held even after the researchers accounted for other factors like air pollution exposure, diet, gender and weight. There a variety of things that could explain the association: stress, for one. People who live in hectic, urban centers tend to have more stress than those in quieter locales, and stress is a well-known trigger of heart attack. ”The noise itself probably does increase stress and the levels of stress hormones like adrenaline. Your blood pressure is probably going up as well,” Dr. Robert Bonow, a professor of medicine at Northwestern Feinberg School of Medicine, told ABC News. Traffic noise may also prevent people from getting adequate sleep at night, another risk factor associated with heart attacks. What’s particularly insidious about a noisy environment is that people may not even know they’re being affected by it. “You might wake up thinking that you had a quiet night, but when you look at it in a lab, you see that your sleep stages have been disturbed,” Sorensen told My Health News Daily. Where there’s traffic, there’s also air pollution, which has been separately linked to heart attack and other markers of poor heart health in several studies. The study suggests that traffic noise doesn’t have to be deafening to affect your health. Forty decibels is about as loud as a bird call or the inside of a library; by comparison, a vacuum cleaner is 70 dB, and a passenger car traveling at 65 miles per hour measures 77 dB from 25 feet away. If you live in a noisy area, Sorensen recommends sleeping in a quieter, interior room. Diet Soda Boosts Heart Attacks, Strokes. Is It Worse Than Regular? Diet soft drinks may be just as bad as regular ones. Are you one of the millions of Americans who choose diet soft drinks over regular ones to avoid the risks associated with high sugar intake? Don’t pat yourself on the back just yet. Research presented at the American Stroke Association’s International Stroke Conference in 2011 suggests a link between diet soda consumption and vascular events, including heart attacks and strokes. Does this make diet soft drinks just as bad as their sugary counterparts? Hannah Gardener, the report’s lead author, isn’t making that claim just yet. “We are still working on the analysis,” she revealed to WebMD. The results have yet to be officially published. This was a small-scale research project; Gardener and colleagues surveyed just 2,564 people, all of whom were based in north Manhattan. Participants were monitored for about ten years and given check-ups to monitor blood pressure, cholesterol, weight changes and more. During that time, about one fourth had a heart attack, suffered a stroke, or died of cardiovascular problems. That’s compared to almost a third of those who drank diet soda every day. Those preliminary findings seem significant — a 48 percent increase in heart attack and stroke risk among those who drink diet soda every day is nothing to sneeze at. The reason for this link is under investigation. Some experts point to a possible tendency of diet soda drinkers to have greater appetites for unhealthy foods. Others note that caramel coloring additives, found in all dark colas, have been tentatively linked to vascular problems. So the jury is out on whether diet sodas are directly responsible for an increase in vascular risk. On the other hand, it is certain that regular sodas are bad for consumers in several proven ways. They are a source of empty calories and excessive sugar, and a major culprit in the American obesity epidemic. So when it comes to which type of beverage is worse for your health, regular soda still takes the cake. Diet soda has not been linked conclusively to life-threatening vascular events. 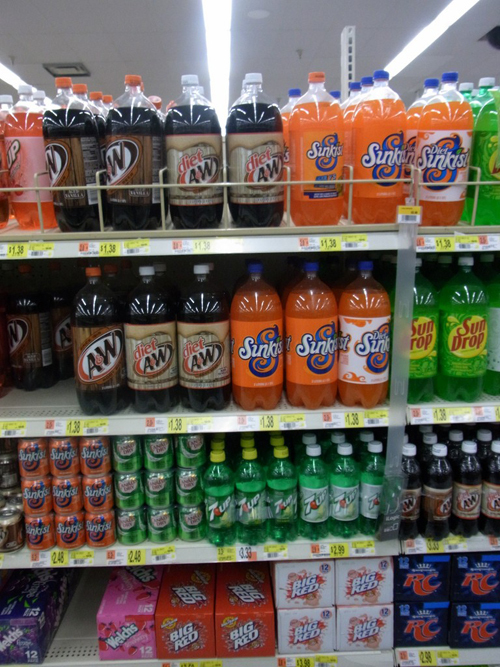 Of course, none of this changes the fact that neither type of soda is doing you any favors. Medical experts agree that when it comes to hydration, good old-fashioned water is your best bet. 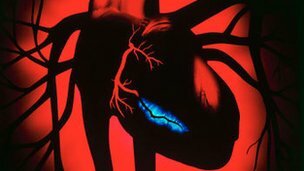 Fewer women than men suffering from a heart attack appear to experience chest pain symptoms, according to a study of more than one million people in the US. Without displaying the classic chest pain symptoms of a heart attack, researchers say some women may not be getting the right kind of treatment. The study looked at patients seen at more than 1,000 hospitals. The research found that among younger women – those aged under 55 – the differences in symptoms with men of the same age were striking. Overall, 42% of women did not experience chest pain compared with 30% of men. And once admitted, the study found that women were more likely to die than men from the same age group. Some 14% of women died compared with 10% of men. The authors, writing in the Journal of the American Medical Association, said: “Optimal recognition and timely management of myocardial infarction (MI), especially for reducing patient delay in seeking acute medical care, is critical. Heart attacks among younger women are relatively rare. Dr Kevin F Fox, a consultant cardiologist at Imperial College Healthcare NHS Trust and speaking for the Royal College of Physicians, said that overall the number of heart attacks and associated deaths were falling, but that when young women had heart attacks the outcomes were not good. “The paper has shown that women, and in particular younger women, under 55 years of age, often do not have the typical presenting symptom of chest pain compared to men when they have a heart attack. The US researchers describe the results of their work as “provocative” and urge further study, but say that for the moment there should be no change in the public health message that chest pain and discomfort could be symptoms of a heart attack.